(Sarasota, FL) With the Major League Baseball season now underway, the Baltimore Orioles’ year-round baseball operations continue in Sarasota with Extended Spring Training. 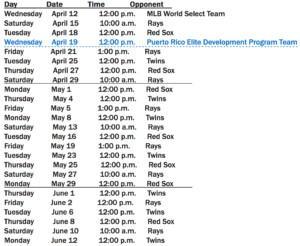 The public is invited to watch Orioles minor league players in action at the Ed Smith Stadium complex in April, May and June. Gates open 30 minutes before game time, and there is no charge to attend the games. Free parking is available in the East Lot. Please note that game times and locations are subject to change without notice due to weather and field conditions. 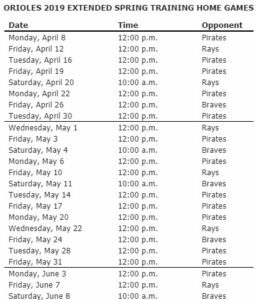 (Sarasota, FL) The Baltimore Orioles announced their remaining Extended Spring Training home games following Monday’s season opener. The public is invited to watch Orioles minor league players in action in Sarasota during Extended Spring Training during the months of April, May, and June. There is no charge to attend the games, which will be held on Field 4 at the Ed Smith Stadium complex. Gates open 30 minutes before game time. Free parking is available in the East Lot. Please note that game times and locations are subject to change without notice due to weather and field conditions. (Sarasota, FL) The public is invited to watch Orioles minor league players in action in Sarasota during Extended Spring Training during the months of April, May and June. There is no charge to attend the games, which will be held on Field 4 at the Ed Smith Stadium complex beginning Tuesday, April 14. Gates open 30 minutes before game time. Free parking is available in the East Lot. Please note that game times and locations are subject to change without notice due to weather and field conditions.